Using the ‘Counting Dead Women’ Facebook page to keep track of the numbers, VTHC organised the action with 63 picture frames with anonymous silhouettes to represent each woman killed in 2018 (as at 29 November) – three quarters by someone they know. It was a sombre affair as the small crowd gathered to reflect on the tragic loss of life from across the country. 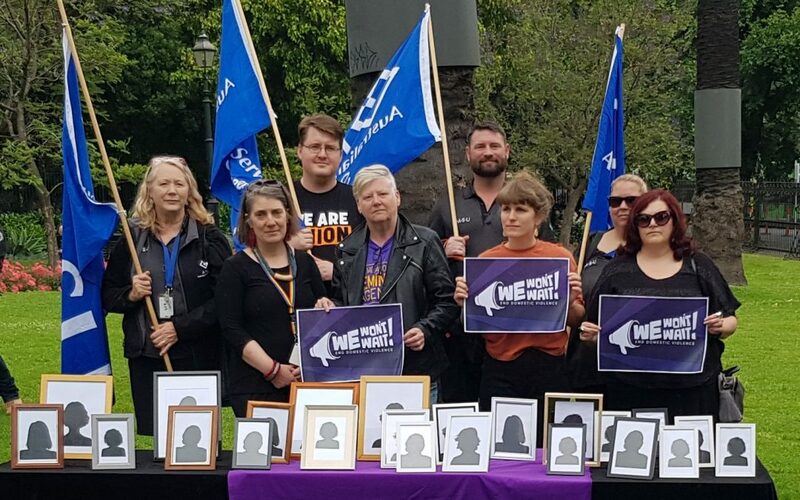 Unions have been successful in having Family Violence leave added to the all industry and occupation awards and continue to advocate for a standard of 20 days of paid FV leave to be added to the National Employment Standards. Local government organisations across Victoria have adopted variations of the clause in their workplace agreements, as we lead the rest of nation in these important pursuits. With rates of more than one woman killed per week, we are highlighting the urgency for recognition that Violence Against Women is a national crisis. We need urgent change in our workplaces and across society to end violence against women.